In Texas, myth often clashes with the reality of everyday government. 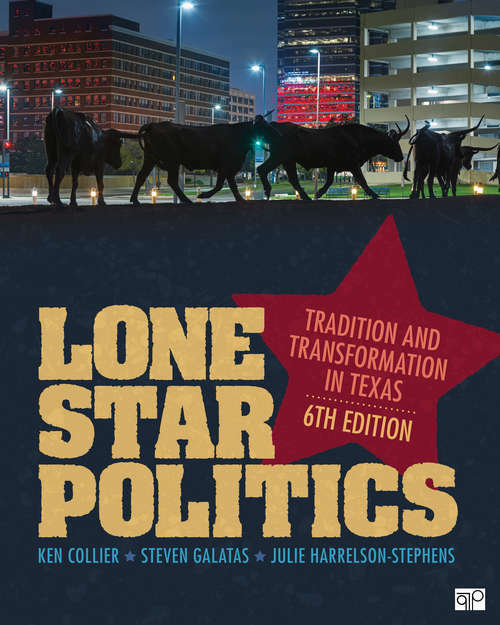 Explore the state's rich political tradition with Lone Star Politics as this local author team explains who gets what and how. Utilizing the comparative method, Ken Collier, Steven Galatas, and Julie Harrelson-Stephens set Texas in context with other states' constitutions, policymaking, electoral practices, and institutions as they delve into the evolution of its politics. Critical thinking questions and unvarnished "Winners and Losers" discussions guide students toward understanding Texas government and assessing the state's political landscape. The Sixth Edition expands its coverage on civil rights in the state, as well as contemporary issues highlighting the push-pull relationship between the state and federal and local governments.